Britain’s departure from the EU is a hard topic to get away from, even at the Edinburgh Fringe. But has anyone in Edinburgh found anything new and, more importantly, anything funny to say about it? Kieran Hodgson admits he’s a nerd when it comes to 1970s British politics. The actor and comedian, who’s made a name for himself in BBC Two sitcom Two Doors Down, says that’s why he based his Brexit show at this year’s Edinburgh Fringe on the largely forgotten first referendum on UK membership of the Common Market. The 1975 vote came down heavily in favour of continued membership – 67% to 33%. Hodgson says he’s drawn to larger-than-life characters – and “the 1970s were rich in them. My favourite was Tony Benn, but also there were people like Roy Jenkins and Barbara Castle [all originally Labour MPs]. Hodgson’s one-man show, called ’75, looks at parallels with the 2016 referendum. It introduces his mother as a pro-Brexit voter to contrast with his own Remain opinions. “I knew there was a danger of making the piece dryly political, so the family relationship gives a warmth,” he explains. There’s a lot more shows about Brexit at this year’s Fringe. Many of them feature Remain-inclined performers talking about their parents having voted to leave the EU in 2016. 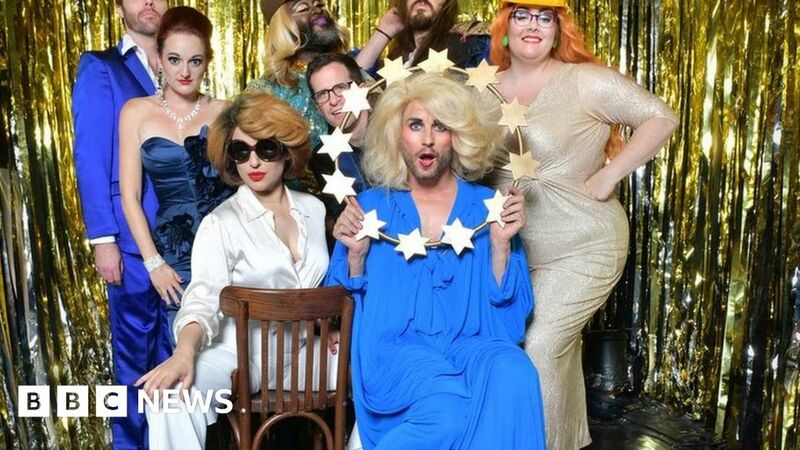 One of the most extravagant is Jonny Woo’s All Star Brexit Cabaret, in which burlesque performer Woo and guests use songs by Richard Thomas, composer of Jerry Springer: The Opera, to explore the 2016 result. Woo is passionately in the Remain camp, but says he wasn’t interested in simply telling off Brexiteers for getting it wrong. “Pretty much any politicians are fair game for satire and comedy,” he says. “But our cabaret’s also about how ordinary voters treated each other during and after the referendum. The show applies the glitz of drag and burlesque to both sides of the campaign. Boris Johnson and Angela Merkel are ridiculed equally. Woo says the drag element helps reassure punters they’re not in for a dreary political rant. Richard Thomas says he tries to avoid the term satire entirely. “Often people mentally file satire away under ‘just not funny’,” he explains. “We have to make it work as comedy. Geoffrey Brown’s show It’s a Dog’s Brexit is a long way from Woo’s spangly costumes. But it’s a sign of interest in the topic that he’s drawing a daily audience to an illustrated lecture on Brexit, delivered with charm and a touch of humour. “I use slides to set out the story so far and to indicate what may happen after March,” he reveals. “I’m a Remainer, but I still try to give all sides of the argument. Stand-up Jacob Hawley is a newcomer to Edinburgh. His show, Howl, also draws material from the voting schism in his own family. On stage and off, though, he talks with warmth about his parents’ pro-Brexit politics. “Some left-wing publications blamed working-class people for the referendum and took the view they had to be re-educated,” he says. “But my family weren’t anti-immigrant and they looked sceptically at the promises politicians were making. One show about Brexit – called, er, Brexit – isn’t stand-up at all but a comedy drama by Robert Khan and Tom Salinsky. It stars Timothy Bentinck – David Archer in The Archers – as a Conservative prime minister trying to negotiate his way out of a prolonged post-Brexit transitional period. Salinsky says that while he was sure Brexit was the right topic for 2018, “it was a tough play to write. You want it to be searingly topical, but there’s also a danger of writing something that goes out of date. Then there’s A Very Brexit Musical, an energetic romp presented by students from Cambridge University. With the luxury of eight musicians on stage, Molly Cook and Anthony Gray’s show has “Joris Bohnson” as its comic lead and tells how politics and journalists need each other deep down. Matt Forde, probably the best-known of the Brexit satirists in Edinburgh this year, has no hesitation in saying he voted Remain. His one-man show, Brexit Through the Gift Shop, offers sharp political stand-up with choice impressions thrown in. “There’s a natural chaos at the heart of Brexit so it makes for great comedy,” says Forde, who hosts the political comedy show Unspun With Matt Forde on Dave and is surely one of the few people who can claim to have appeared on both Mock The Week and Question Time in the same year. “It’s about jealousy and ambition and career, which is often the meat of political satire anyway,” he continues. “I notice people are much keener now to seek out political comedy than they were,” he continues. “Compared to the coalition years in the UK, people are just more interested in what’s happening. “Everyone can see how inevitably it will affect their own lives, whether they were pro-Brexit or not. Every few years, when there are these big binary choices being made, it can be a great time for political comedy. The Edinburgh Festival Fringe continues until 27 August.